I am kind of wondering why this is called Cowboy Lasagna. Do cowboys eat pepperonis, Italian sausage and ground beef? Maybe I am a cowboy and didn’t know it! On researching this mystery, I found that this pepperoni style lasagna is originally a Trish Yearwood recipe – so, Thanks Trish! I heard about this recipe from a friend and decided to try it for myself because, for one thing, the Ragu Pasta saucemakes this simple. You need to know that this makes about 10 lbs of lasagna and don’t be like me because I’ve only had two large pieces so far today! There’s MORE in the fridge! HELP!!! Mr. Loaves and Dishes will be home soon and he will save me from myself, right? Anyway, I know you recipe seekers are here for the goods, right? Coming up right now! 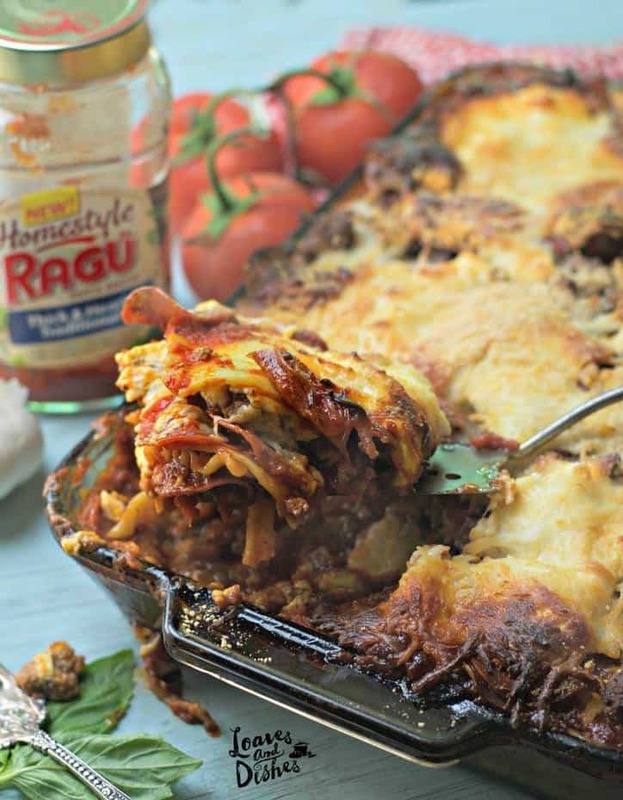 You should check out the other great recipes at Ragu Pasta Sauces – you can find those HERE! I hope you have seen my video making the rounds out there! Turn the sound up because the music is fun! Prepare everything ahead before you try to assemble. Just makes it easier. You can brown the ground beef and Italian sausage together and just add as one ingredient if you want – will taste the same. If you can’t find Italian sausage in a bulk form – just use the links and squeeze the meat from the casings and discard the casings. If you want some super melty and tasty lasagna, use the fresh mozzarella – WOW! Wonderful! I used the pre-shredded type for the video because I know that is what most American’s use – but if you use the fresh, you won’t be disappointed. If you want some super duper tasty lasagna, use the REAL parmesan cheese! You REALLY won’t be disappointed! It is so super flavorful! In lots of recipes, you find me doctoring sauces with lots of herbs. Not needed in this recipe! The Ragu Pasa Sauce I used here has it ALL IN THERE! Always start a lasagna with some of the sauce in the bottom of the baking dish – it helps prevent sticking! After cooking the noodles, I always lay mine out on a cookie sheet and coat with a little spray of non stick spray. Noodles like to stick to one another and this helps keep things unsticky. This dish is WONDERFUL warmed over – which is good because it makes a TON! Invite friends over for this dish! Ragu says that this is their thickest sauce yet, and I believe it! Did you see the video (above?). The sauce hugs the pasta! I started out this post by stating that I don’t know why this is called Cowboy Lasagna – which is entirely true but this recipe reminds me of my dad. My dad was simply the greatest man ever (I know, I know – count me as a daddy’s girl). I wish you could have met him! My dad was a recipe creator and a creative recipe namer too. Mom always says that is where I get this cooking streak from. My dad made so many memorable recipes – like grape jelly omelets and Medlin’s Egg Muffins and Dad’s famous WHOOPY hamburgers (what you say when you eat one). Grape Jelly Omelet – not my fav. Anyway, I know this is a recipe is one he would have loved – especially for the mystery of the name. He would have made lots and lots of jokes about pepperoni eating cowboys. AND THAT is what I love about recipes like this. 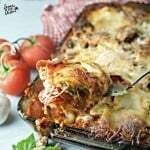 In my family, we have lots of family tradition recipes that are like this Cowboy Lasagna – something we ate a lot because it was simple and yummy. Recipes that are always remembered with good conversation around the family table. Because eating together, listening to each other and being there for each other is what family traditions are all about. I would love to hear about some of your family tradition recipes! In fact, I was thinking about starting a series of recipes that are ALL family tradition recipes. What would you like to see me share? Just let me know and I’ll see if I have it in my magical recipe cards! Just leave me a comment below in the comment section and I’ll see what I can do! for sponsoring today’s post and inspiring me to share my family traditions! IF YOU ENJOYED THIS RECIPE, PLEASE VISIT WWW.LOAVESANDDISHES.NET FOR MORE GREAT RECIPES! Preheat the oven to 350. While the oven is preheating, brown the ground beef and the Italian sausage over medium heat in a frying pan. When browned, remove each from the heat and reserve. Cook the Lasagna noodles according to package instructions and reserve. In a 9x13 baking dish Spoon several spoonfuls of the pasta sauce into the baking dish. Begin layering the ingredients as follows: 3 lasagna noodles, 1/3 of the pasta sauce, ⅓ of the browned ground beef, ⅓ of the italian sausage, ⅓ of the pepperonis, ⅓ of the Mozzarella Cheese, ⅓ of the Ricotta Cheese, ⅓ of the parmesan. End with the cheeses on top. Place the 9x13 pan on a baking sheet and place on the middle rack of the oven. Bake for 45-55 mins until heated through and bubbly. Cheese will be melted throughout and the edges will be browned. If you like yours less browned, lightly cover with aluminum foil for the last 15 minutes. Remove from the oven and serve hot. Great with garlic bread and a salad! 0 Response to "COWBOY LASAGNA"